Read REVIEWS for my Jazz Guitar classes HERE. Video of my Jazz Guitar 2 class HERE. Wathc this Video Advert that tells you all about the guitar tuition you can expect (South London, Dulwich based guitarist/tutor. More videos below. Branco is DBS (formerly CRB) checked. 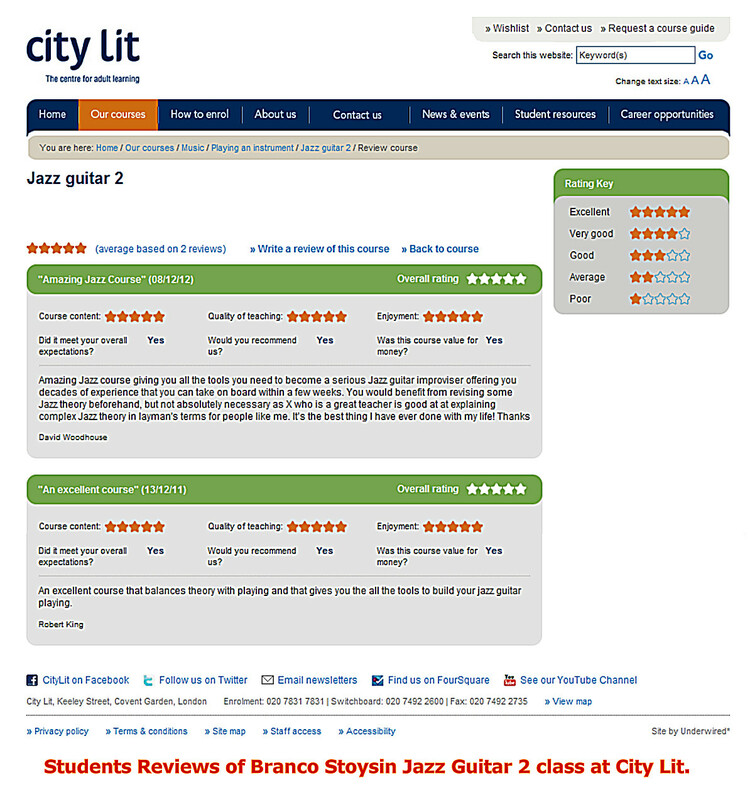 WHAT THE STUDENTS SAY ABOUT BRANCO STOYSIN GUITAR CLASSES at previous classes at GOLDSMITHS COLLEGE & currenJAZZ GUITAR CLASSES at CITY LIT. For live videos samples scroll to the bottom. Also available 1 to 1 private lessons and 1 to 2 and 1 to 3 as group lessons, with the fees shared between the group. 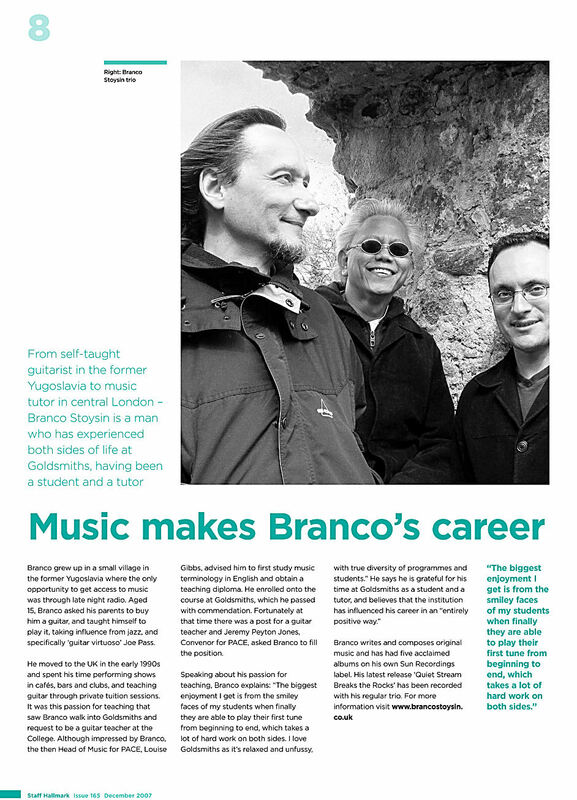 Click HERE for Goldsmiths College STAFF HALLMARK article about Branco. To watch video samples of tuition go to the bottom of this page. 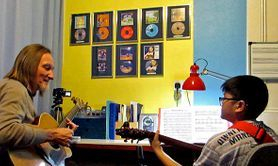 “My 14 years old son is developing a real passion for the guitar and is such a pleasure to hear him enjoying his progress. None of this would be possible without Branco’s wonderful combination of encouragement and wit.” A.W. 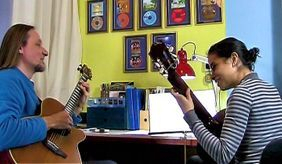 “Branco is a fantastic guitar teacher and has taught Dulcie (15) for nearly five years. He is inspiring and creative and she really enjoys his lessons. He has imparted his great love of music to her, both performing and composing, and it is thanks to him that she gets so much pleasure from playing her guitar.” V.D. “The album launch at Pizza Express Jazz club was an evening of great music from Branco, Leslee and Buster. It reminded me what a privilege it is to be taught to play by a guitarist of Branco's ability. Every lesson is full of magic moments and a unique chance to play duets with a great guitarist.” P.L. “I don’t only look forward to a lesson and learning to play the guitar but to wonderfully therapeutic time of being in Branco’s presence" P.S. all the tunes she had learnt with you, no music just by memory. She brought joy to my heart and a tear to my eye. It was the best gift I had on my birthday. One I know you are hugely responsible for the making of."D.T. 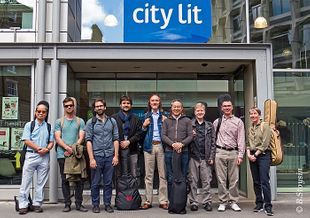 Jazz Guitar Ensemble at City Lit, London. Tutor Branco Stoysin. Graduates of Jazz Guitar 2 & 3 courses play in an ensemble setting. Genuine live recording demonstrating students achievement after only 4 class sessions. This video is solely for demo purposes. Music arrangements, original tunes, video and photos © B.Stoysin. All Rights Reserved. “Great job with the ensemble, and many thanks for all your inspired guidance." CITY LIT college. 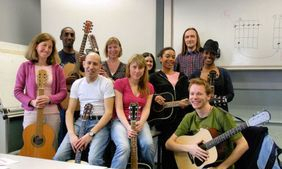 Branco Stoysin's Jazz Guitar 2 class at City Lit college in London. Playing "Take Five" by P.Desmund and "Miss D" by B.Stoysin (hear the echoes and spirit of Joe Pass in this performance!) . Genuine live video recording no editing of music and sound. Teaching pieces-arrangements and the video are © by B.Stoysin. Solely for demonstration of Branco’s teaching and students achievement purposes. All rights reserved. Read REVIEWS for my Jazz Guitar classes HERE. BRANCO STOYSIN - GUITAR TUITION VIDEOS Best guitar tuition your money can buy in the south London and beyond. Branco Stoysin 1 to 1 guitar tuition guitar lessons examples. Genuine video recording no editing. Tunes used here are solely for teaching purposes. These videos and teaching pieces-arrangements are © by B.Stoysin and are solely for demonstration of teaching purposes. All rights reserved. These samples, after only two lessons, are a result and achievement by the student. Click HERE to watch video. NEW VIDEO! The 10 years old student of mine, a complete beginner, who’s been learning the guitar for only 6 months, performs the tune “Mellow Sun” that he learnt in only two lessons. My mission has been completed, one young soul has been saved from all the “music” trash that the youth is exposed to and it is imposed onto…Click HERE to watch the video.